Are you a Mac person? I’ve used PCs all my life but late last year I bought a MacBook Pro. I like it a lot and understand why people love their Mac computers. That said, I don’t think it’s the God-sent computer that Apple enthusiasts would like you to believe. It does “hang-up” like Windows based computers, it is slow at times, and, as you might have heard, Apple has backed away from their message that Apple computers are virus-free. One of my favorite applications for my MacBook Pro is MailTab for GMAIL. If you use GMAIL (http://www.gmail.com) and a Mac you’ll find it helps you get to your email box faster and more efficiently. Instead of bumbling around trying to find the window in your browser with your email, you simply click an icon in the top menu bar on your Mac – and it instantly appears. 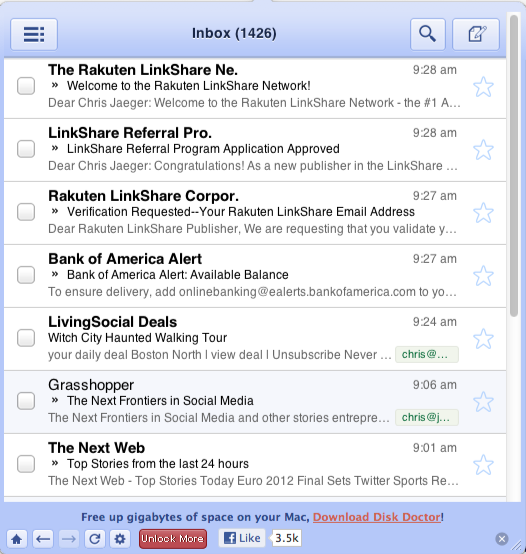 MailTab for GMAIL is the ideal app for instantly accessing your GMAIL account without having to open your web browser. Download it for free and benefit from visual and audio mail notifications, quick access to your inbox and the ability to respond to mails at lightning speed. After downloading and installing, simply click on the MailTab icon in the top menu bar whenever you want to check your GMAIL account and a window containing the GMAIL interface opens up. Review your email, respond, and then click the top menu icon again to close out of the session. MailTab for Gmail allows you to increase the speed at which you can access and respond to your emails while using your Mac computer/laptop. Here is a link for more information and the download. Once installed, just click on the little envelop icon in your top menu bar. This opens up the MailTab window with your GMAIL inbox. You can do this from any active application you are using without leaving that application. Here's what you see after clicking the MailTab for GMAIL icon. Click the icon again and the dialog box closes.